What is ADA Para Transit PLUS? ADA Para Transit PLUS is an expansion of the regular CTA ADA Para Transit service. The PLUS service is not required by the Americans with Disabilities Act (ADA), so the service operates differently than the regular CTA ADA Para Transit service. The goal of ADA Para Transit Plus is to provide transportation to people with disabilities that live outside of the mandated ¾ mile service corridors. The PLUS service is a countywide service that is currently only available in Harrison and Jackson counties. ADA Para Transit PLUS is provided as capacity allows. Who can use ADA Para Transit PLUS? Anyone who has been certified to use ADA Para Transit is eligible. You must complete an application process to become certified. How do you qualify for ADA Para Transit? There are three separate categories or conditions that can enable you to use ADA Para Transit. 1. You have a physical or mental impairment that prevents you from getting on, getting off or riding any ADA accessible bus by yourself. You must need help from someone other than the bus operator. 2. 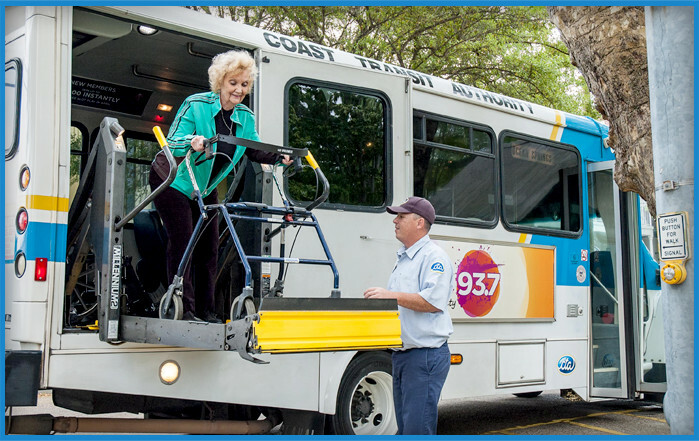 You need a wheelchair lift or other boarding assistance device and can, with that help, board, ride, and disembark the bus. ADA Para Transit is only justified under this category if, for some reason, a boarding device cannot be used at a regular bus stop on a CTA Fixed Route. 3. You have a specific impairment related condition that prevents you from traveling to or from a bus stop. However, just because it’s difficult getting to a bus stop, does not qualify you. Your condition must make travel to a regular stop impossible. Think you fit one of these categories? You may be eligible for ADA Para Transit. To find out for sure, you must be certified eligible. Applications for certification are available at the CTA office at 333 DeBuys Rd., Gulfport, our web site www.coasttransit.com, or through local agencies that serve the disabled. If certification is granted, you must then get a free ADA Para Transit ID card made at the CTA office. ADA Para Transit service is curb-to-curb (Door to door as needed). That means you must wait at the curb in front of your pick up point, at the scheduled time for the bus to arrive. If you need an attendant or a mobility aide; it’s your responsibility to provide one for yourself. This includes finding someone to help you with packages, if needed. Remember, CTA bus drivers are not trained attendants. There is little they can do to help you get around. You will find a detailed list of limitations affecting drivers at the end of this section. Direct Support Professionals (DSP) and Personal Care Attendants (PCA) will ride free of charge. You must make an appointment to ride ADA Para Transit PLUS. Service requests are taken 7 days a week from 8am to 5pm. Requests must be made prior day to 14 days in advance. Please do not try to set up appointments with the driver! You must call the office to schedule an appointment. If your travel plans change, you need to cancel your appointment at least one hour before your scheduled pick up time or CTA will mark it as a NO SHOW. If you fail to cancel in advance, this could jeopardize your opportunity to schedule future trips! 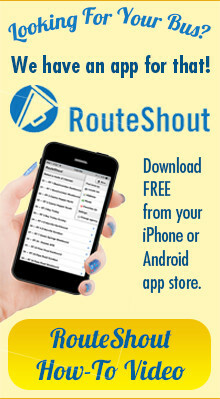 · Go into the home to assist passengers. · Push wheelchairs across areas that are not paved or covered with leveled concrete. · Take a wheelchair off a raised porch which is not connected to a ramp. · Wait more than 5 minutes for passengers to board the bus. Cost: $2.00 per fare zone. All trips are pay as you go. There is no credit line available. You must have the correct change ready for the driver before you go. For your convenience, we sell ADA Para Transit passes, which can be used on the ADA Plus service. You can purchase them in sheets of 10 passes for $20.00. Each pass is good for one fare zone. Passes are non- refundable.